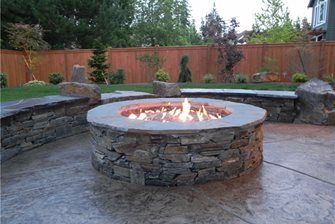 A wood-burning fire pit with boulder seating. A covered outdoor kitchen provides shelter from the rain. 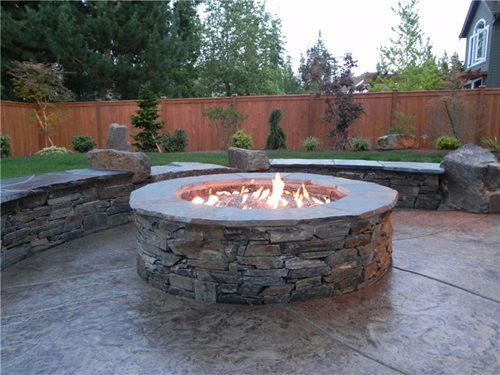 This gas fire pit provides a space for the adults. Ledgestone seat walls with a flagstone cap and inset boulders. Stamped concrete with flagstone borders. 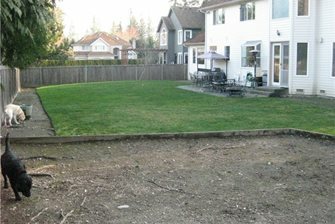 A before photo of the backyard. 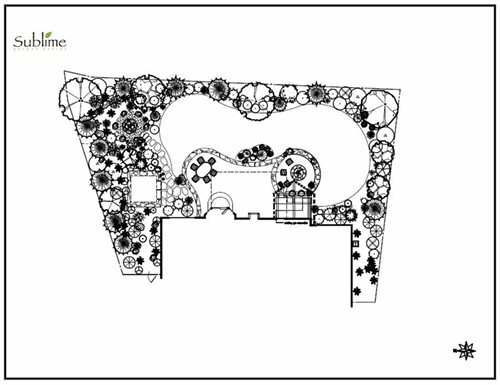 The plan created by Skievaski for this backyard. 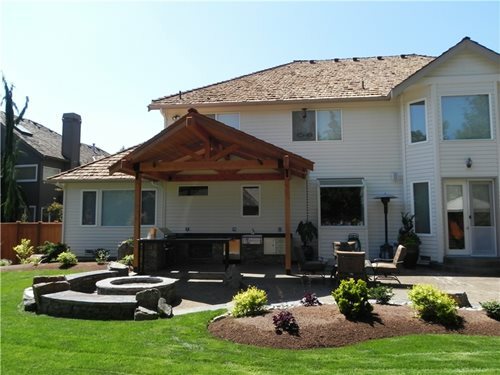 This Sammamish, Washington family had outgrown their backyard. Their old landscaping included a swing set and large expanse of lawn, which they no longer used. Heidi Skievaski, owner of Sublime Garden Design, a company based north of Seattle, came up with a plan for turning their unused backyard into a nature-inspired retreat that would suit the needs of the whole family. Property size: 8,000-10,000 sq. ft. 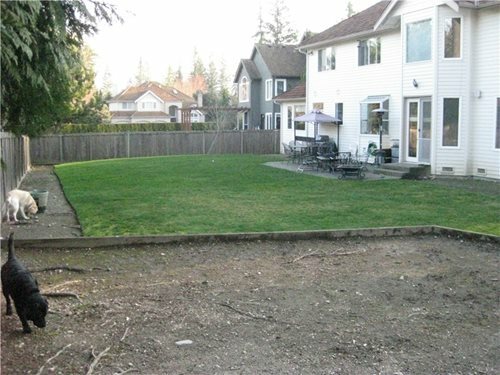 Homeowner Requests The homeowners wanted their yard updated so that it would better accommodate their teenage children. They also wanted an inviting space to spend time entertaining and relaxing outdoors. Specific requests included separate areas for teens and adults, a covered barbecue area and low-maintenance plants and materials. "Originally, there was not a single plant in their backyard - it was entirely grass," remembers Skievaski. 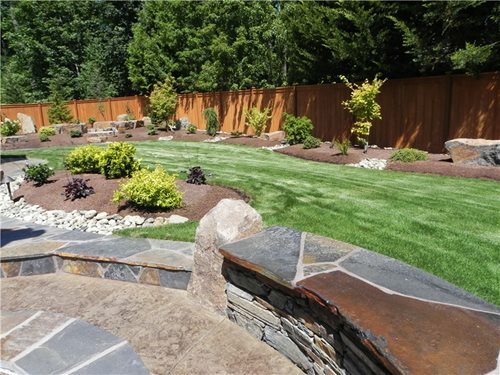 The homeowners wanted to add color and texture to the yard, but didn't want anything high-maintenance. 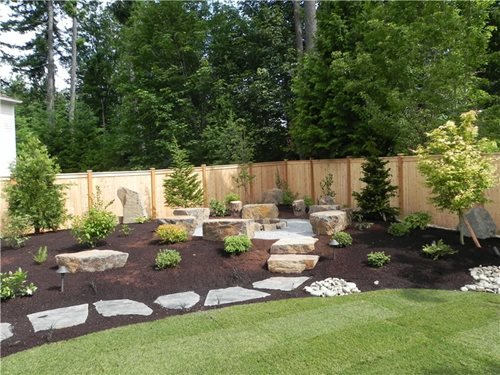 They also requested that the yard have a natural, rustic style. Design Solutions In order to create separate areas for the teenagers and adults Skievaski opted to include two fire pits in her design. The fire pit for the adults is close to the house and burns gas, making it convenient and easy to light. The fire pit for the teenagers is farther out in the yard where the playset used to be. This fire pit is wood-burning, giving it a campfire atmosphere and making it the perfect spot for roasting marshmallows. "To form a more natural terrain around the wood-burning fire pit, we used the dirt that had been excavated from the adult fire pit and outdoor kitchen area," explains Skievaski, "It is always a goal of mine to reuse resources on site." To complete the natural look, large, blocky boulders were used for seating. 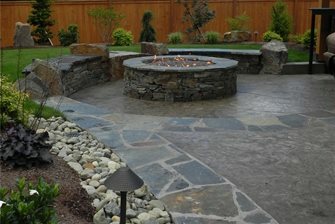 The gas fire pit has a more refined look, surrounded by seat walls made of ledgestone and capped with flagstone. Because this neighborhood's soil is compacted clay it does not drain well. To avoid having a soggy lawn sub-surface drainage was installed. A full French drain in a herring bone pattern carries excess water away from the lawn area. 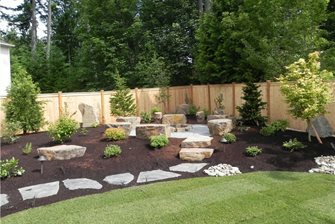 Get more ideas for landscaping with boulders. 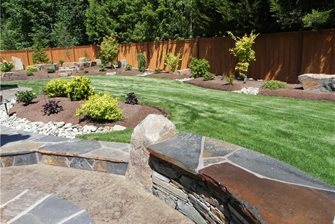 See six photos of how boulders can be used for functionality in a garden. 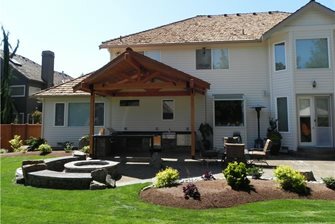 Designing outdoor spaces in the Northwest often requires a great deal of planning for wet weather. For this project, Skievaski designed an outdoor kitchen with a solid roof. "The homeowner wanted something that would keep him dry while grilling," she explains. The patio cover features a sloped roof and rain chain to deal with frequent precipitation. Working with the Client's Budget At the beginning of the project the homeowners had planned on completing their backyard in phases as money became available. But once the work was underway they decided to go through with the complete design, which included an area for a hot tub. "We had discussed using flagstone pavers for the patio and fire pit areas," says Skievaski, "but with the decision to install the entire plan at once we needed to find other ways to save money." For the main patio, stamped and colored concrete was used instead of the proposed flagstone. Decorative concrete is incredibly versatile because it can be made to look like traditional paving materials at a lower cost. Gravel, which is the most economical paving option, was used around the wood-burning fire pit as well as along the side of the house for a dog run. 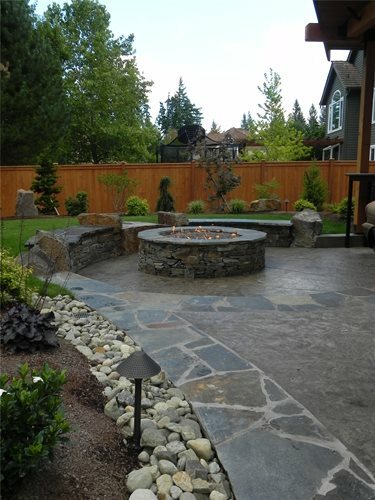 "I chose to use flagstone borders and inset large boulders to carry the natural, rustic theme throughout the yard. In this way, we were able to achieve an authentic look without the expense and labor of using natural stone for all of the hardscaping," explains Skievaski. Now this backyard has something for the whole family. The teenagers have a space to spend time with friends and the adults have an area to relax and barbecue. Plants with interesting texture and foliage, as well as large boulders make the space feel natural and inviting. By considering their needs, desires, lifestyle and budget, Skievaski was able to create a wonderful outdoor space where they will enjoy spending time for years to come.